Sunshine! And a (relatively) calm sea. The temperature is up to 19 degrees and it’s possible that the swimming pool, which yesterday had not just waves, but breakers, will be refilled and opened for the hardy souls on board. Even with it netted off, they’re out there, bundled up in rugs and towels, beanies pulled low, squinting at their Kindles and retro books, determined to make the most of the sun. Today there were lectures, ship tours and all the usual offerings at the spa and gym. Generously given a credit there, I decided – foolishly, in retrospect – to go for the metabolic function test. This involved sending a current through me from my foot to my hand, generating a printout telling me how much weight I need to lose, how dehydrated I am, and how much invisible fat is lodged around my organs. 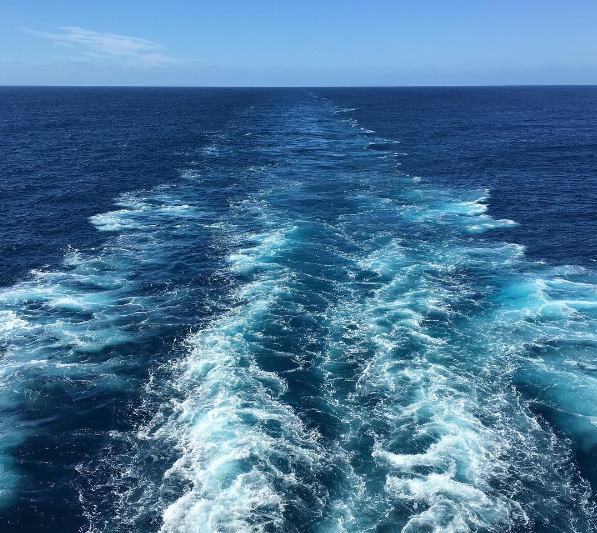 Given that there are about eight places to eat on the ship, many of them continuously available, and not much physical to do, it was not a helpful exercise (not any sort of exercise at all, in fact). Naturally, the follow-up anti-toxin spiel was lost on me. More distracting were the tours of the bridge and the control room: full of screens these days, of course, and buttons (“You are not allowed to push any buttons!” was the stern warning before each tour). But the bridge still has a classic wheel, and a sextant in a perspex box with a dramatic but redundant ‘In case of emergency break glass’ label (it had a hinged lid). More to the point, you'd need to fish out the paper chart and find the guy who knows how to use it and the sextant so that, if the GPS won’t pinpoint your position with its usual 30cm variation, the sextant can do it to within, ooh, 30 or 40 miles. The bridge is the brain of the ship, Aleksander from Montenegro told us airily, and the control room is the heart. Stanko from Croatia disagreed: they are both bodies and the ship is the soul. Pretty airy-fairy stuff from a man who spends his working day in a chilly windowless room full of screens and buttons. I did notice, though, that both places had Christian icons on the wall, the one in the control room showing Jesus pointing the way to the steersman, standing behind him with one hand on his shoulder. The afternoon was warm and sunny, the sea calm and empty, and the sun eventually sank, with the expected but always exciting green flash. The dinner theme was Moroccan (my tabbouleh is better) and the cabaret show tonight was an energetic compilation of movie musicals, with some excellent dancing on dangerously high heels. Tomorrow morning we reach land again: Hobart – my fourth visit to Tasmania.